An Ordinary Life : Fishing for ICE CUBES! Have you ever fished for ice? If not you really should, if you have, do you know why it works? 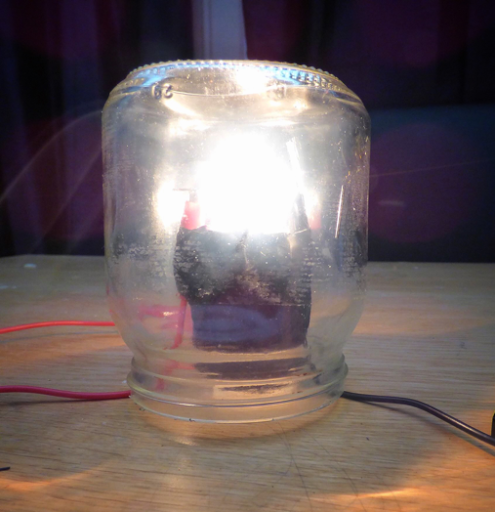 I have included all the science behind this experiment at the end, especially useful for children who want to know more about science as this will teach you a little about thermodynamics! This is great fun for all ages! I even wanted a go! 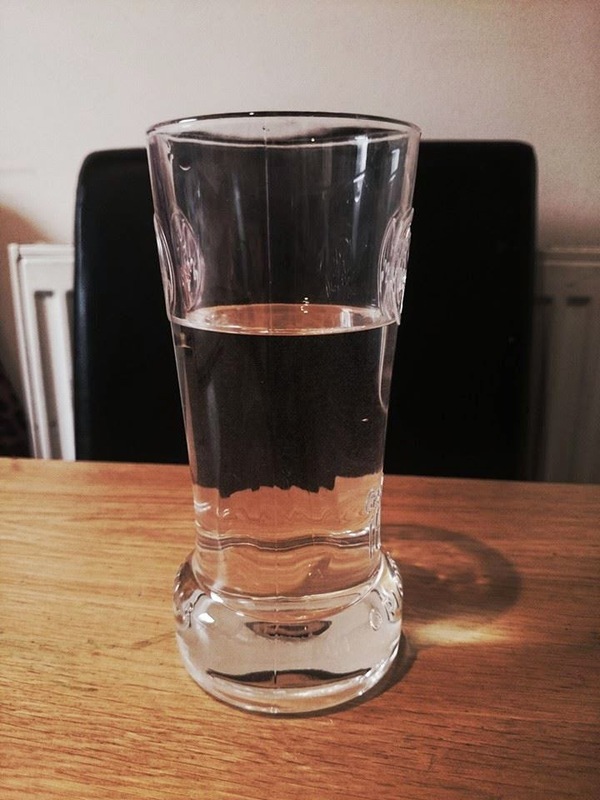 Fill your glass with water - Not to the top as there needs to be room for your ice! Put in some ice, we used 6 cubes at a time. Using your string try to get the ice. Sprinkle some salt on the ice. This is the hard bit - you have rest the end of your string on top of the salt sprinkled ice sitting in your glass and WAIT a few minutes. Try to get as much of the string as you can to touch the ice still having some left to pull it up with. Lift the string out of the glass now. Have you caught a piece of ice? If you like you could time this and every minute you can check to see if it as worked. How many minutes do you have to wait for the best effect? During this experiment we noticed that the string didn't stick to the ice before adding the ice, but when we sprinkled salt on the ice cubes it did why? FACT: Ice forms when the­ temperature of water reaches 0 degrees Celsius. When you add salt, the temperature drops, but did you notice that the ice melts? This is because the salt dissolves into the liquid water in the ice and around the ice, reducing both the temperature of the water and the ice. 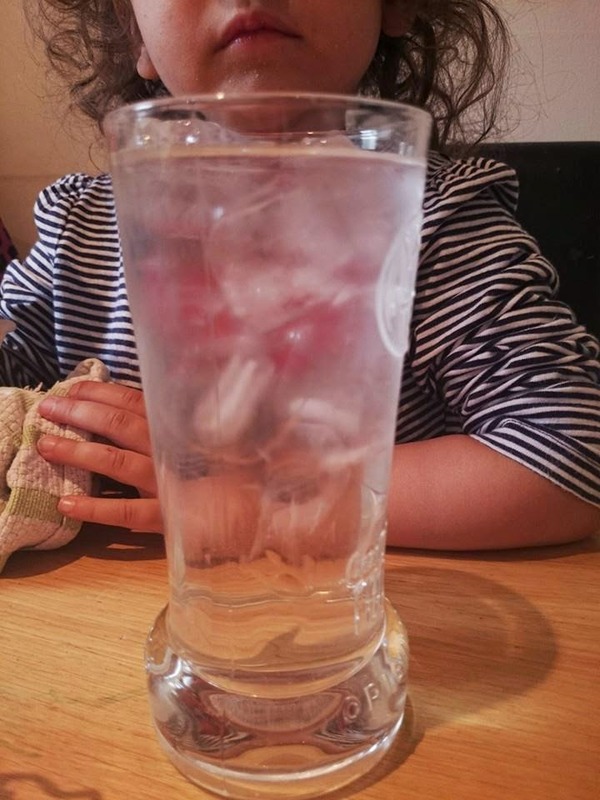 Before you add the salt, the ice and the liquid water sitting in the glass will reach an equilibrium state, they both reach a temperature of 0 C freezing point. However, when we add salt we not only lower the freezing point of the ice but of the water too. FACT: The temperature of an ice cube can range from the freezing point of water 0° C to well below this temperature depending on the temperature of the freezer and how long the ice cube has been out. This is not a chemical reaction but a physical one; it's just a redistribution of heat between the latent heat of fusion of the ice and the specific heat of the water. Basically the salt stole energy (heat) from the ice cube which then cooled it down. Why does the water go below freezing and not turn into ice? The reason this happens because the salt dissolves in the water molecules in the ice, as this happens it melts the ice into water and brings down the temperature of the water. But the water is cooled too, this is because the salt molecules (sodium chloride molecules) sodium ion and a chloride ion break apart in the water. They confuse the water molecules so they can’t freeze as easily which is why, although the water is below freezing, it won't solidify and turn into ice. Salt water has a lower freezing point than pure water. 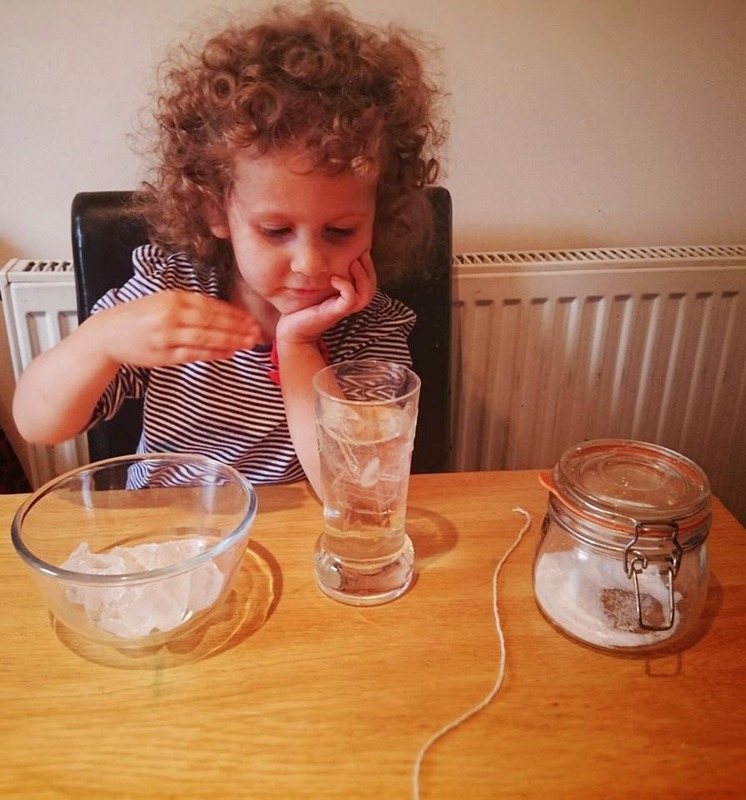 The melted ice mixes with the water in the glass which reduces the temperature of the water until the water and ice reach an equilibrium again but this time much lower, this takes a while which is why we have to wait for it to cool down enough after we add the salt. How does the piece of string stick to the ice? When the ice melts the string is able to move down a bit into the ice then the water in the glass moves up and refreezes over the string. 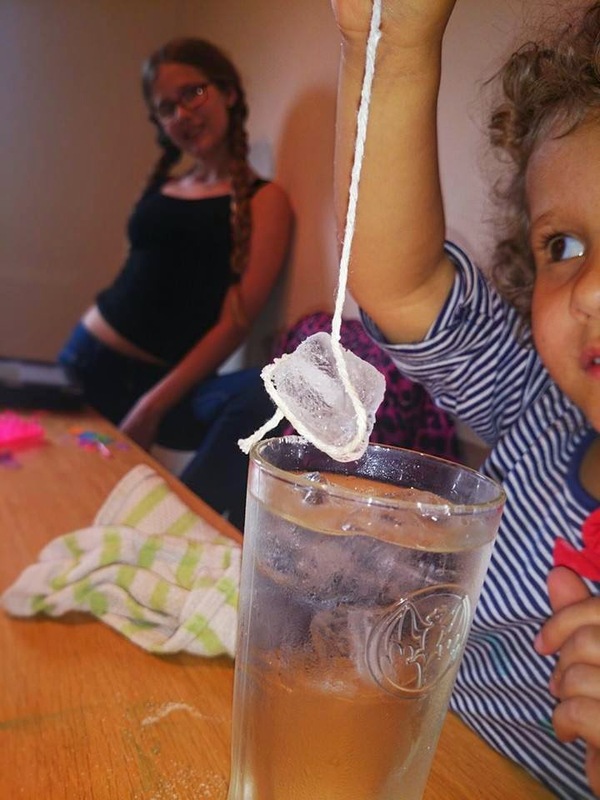 The piece of string is stuck and you can pick up your ice. It's like magic but really it's all about SCIENCE! 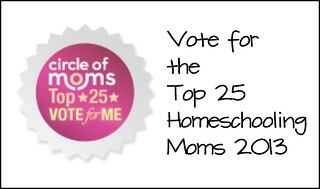 Thanks so much for sharing this:) yet another wonderful experiment! We will definitely be doing this one, thanks!